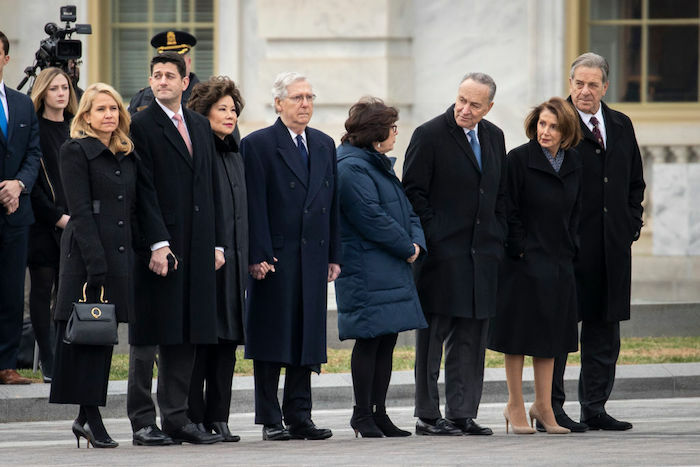 President Donald Trump shook the hand of former President Barack Obama and former first lady Michelle Obama during the funeral of George H.W. Bush on Dec. 5. Trump and First Lady Melania Trump were seated next to the Obamas, who were in turn seated next to the Bushes. The Clintons were seated between the Bushes and Carters. It’s the first time all of the men have been in the same room together. Former President George W. Bush eulogized his father, the 41st president, along with former Canadian Prime Minister Brian Mulroney, former Sen. Alan Simpson, and his biographer Jon Meacham. “Looking forward to being with the Bush family. This is not a funeral, this is a day of celebration for a great man who has led a long and distinguished life. He will be missed,” Trump tweeted before the funeral. Bush’s casket will be loaded on Air Force One for another memorial service in Texas. Then, his casket will be buried in College Station, Texas, at his presidential library, according to reports. Robin, his younger sister, died from leukemia at the age of 3. His mother, Barbara Bush, died earlier this year at age 92. His dad died at the age of 94 over the weekend. “George H.W. Bush was America’s last great soldier-statesman,” Jon Meacham, who was his presidential biographer, said in the eulogy. “He stood in the breach in the Cold War against totalitarianism. He stood in the breach in Washington against unthinking partisanship,” he added.